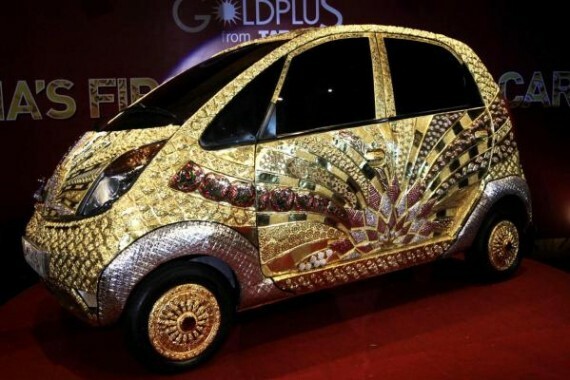 The world’s cheapest car, Tata Nano, turned into one of the most expensive cars in the world. How? After covering Nano with 80 kilos of gold (22k) , 15 kilos of silver and studded with more than 10,000 precious stones and gems. The price tag is $4.6 Million ; not that anyone really expects it to get sold. The car shall be displayed on Tata owned jewelry stores, Gold Plus, around India. It is expected to give a fillip to the Nano as well as the Gold Plus jewelry stores that are being promoted by Tata. Tata claim that the Gold Plus stores are celebrating 5000 years of jewelry making in India.